“We believe that the economic, social and environmental performance of governments, companies and other actors can be guided and benchmarked through these international standards related to human rights, responsible business conduct, due diligence, and stakeholder engagement, including the assessment and monitoring of these issues. It is in this respect that the #VoluntaryPrinciples on Security and Human Rights Initiative is one of the multi-stakeholder forums that Canada strongly supports, and we look forward to contribute towards its continued expansion and implementation”. Patricia Pena. Director General, Economic Development – Canada’s International Development – Global Affairs Canada accepting on behalf of the Canadian government the presidency of the #VoluntaryPrinciples on Security and Human Rights Initiative (2016-2017) yesterday. 60 Days for 60 Million Displaced People The members of the Humanitarian Coalition unveiled today a national campaign in the lead up to World Refugee Day, on June 20th, to raise awareness and funds for the 60 million people displaced around the world. Supported by the Honourable Marie-Claude Bibeau, Minister of International Development and La Francophonie, and Arif Virani, Parliamentary Secretary for the Honourable John McCallum, Minister of Immigration, Refugees and Citizenship, the “Help Them Dream Again” (link is external) campaign aims to mobilize all Canadians in support of refugees worldwide, with a particular focus on children. Together, they call on Canadian humanitarian organizations and the corporate sector to join the campaign and encourage all Canadians to get involved. “Today we start a 60 day countdown to World Refugee Day on June 20th – 60 days for the 60 million people forcibly displaced from their homes due to disasters, conflict and crises. More than half of this number are children. We’ve seen so much generosity and compassion from Canadians for the Syrian refugees. We ask Canadians to see this as an opportunity to better understand and support the millions of refugees who will never make Canada their home and the efforts underway to assist them around the world,” said Patricia Erb, Chair of the Humanitarian Coalition and President & CEO of Save the Children. Humanitarian Coalition members CARE Canada, Oxfam Canada, Oxfam-Quebec, Plan International Canada and Save the Children are proud to collaborate with trusted partners such as the UNHCR Canada, World Vision Canada, Islamic Relief Canada and the Canadian Foodgrains Bank to promote the needs of refugees and displaced people worldwide. The participation of other Canadian international NGOs is welcome as the campaign unfolds. “Behind the numbers, refugees are ordinary people facing extraordinarily difficult situations. From Yemen to Jordan, from Cameroon to Kenya, refugees need our attention, but also the care and assistance they need to rebuild their lives. We welcome this campaign by Canadian partners to highlight the plight of refugees around the world,” said Minister Bibeau. The campaign has already enlisted the backing of key corporate and media partners, and an official announcement will be made once agreements have been finalized. In the meantime, Canadian businesses are encouraged to join this effort. ‘’All over the world, people are leaving their homeland due to war and conflict. Canada is strongly committed to resettling refugees from all around the world and 2016 is expected to be the most ambitious resettlement year in Canadian history. I thank Canadians for showing our values of compassion, kindness, and generosity by supporting this campaign,’’ said Mr. Virani. "UNHCR has been calling for more support and increased solidarity with refugees all over the world. 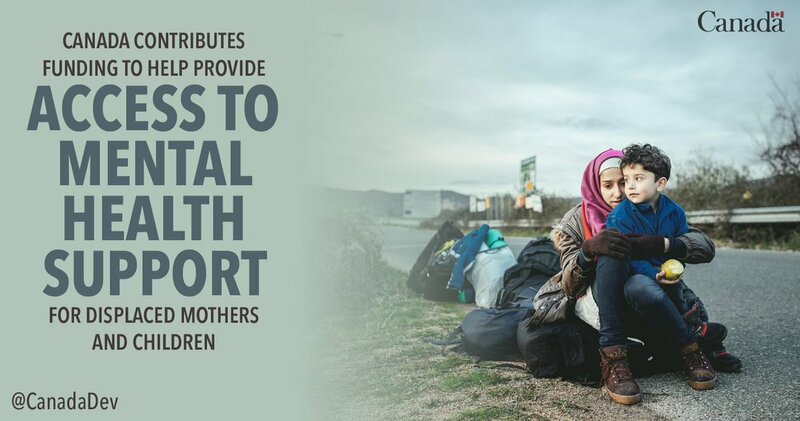 We are happy to support this campaign by Canadian humanitarian agencies, which is yet again another demonstration of Canada's longstanding commitment to help and assist refugees," said Furio De Angelis, UNHCR Representative in Canada. Canadians can learn more and help raise their voice for the 60 million displaced people at www.worldrefugeeday.com (link is external) Together, we can save more lives. "A side from the sports activities implemented by CARE International in Egypt and its volunteers. The activities are part of the “Improving Syrian and Egyptian children’s access to formal and informal education” project, which is funded by Canada Affairs and is implemented in four governorates (Cairo, Giza, Qalioubya and Sharqiya). As part of the project activities, Sports days were implemented in the 28 schools with the aim of improving the school learning environment and making it more attractive to the students, in addition to enhancing the social bonds between Syrian and Egyptian students in the schools." "When the kids come to ask how much they need to pay to access the Makani and i respond that its free - the smile on their faces is indescribable. That always makes my day." Alaa Kraishan is a Community Mobiliser at Jordan River Foundation (JRF) run Hainaazzal Makani Centre in Jerash. With support from Canada’s International Development – Global Affairs Canada, the Makani supports 80 children everyday with informal education, life skills and psychosial support. The Syria Relief Fund will provide $2.35M to UNICEF for asylum seekers stranded at the Jordan-Syria border. We are thankful to receive Canada’s International Development – Global Affairs Canada funding for mental health support programs in communities in northern Iraq. Minister Bibeau will travel to Washington to participate in International Monetary Fund and World Bank Spring Meetings. The Honourable Marie-Claude Bibeau, Minister of International Development and La Francophonie, today announced a three-day visit to Washington, D.C., from April 15 to 17, 2016, to participate in the Spring Meetings of the International Monetary Fund and the World Bank Group. During her visit, Minister Bibeau will meet with representatives of the World Bank, ministers of development, heads of international organizations and other key partners. The Minister’s engagements will focus on several of Canada’s priorities, such as the global financing of education and the importance of institutional support to empower women and girls in developing countries. The Minister will also underscore Canada’s support of refugee-hosting countries affected by the crisis in Syria, host a meeting of like-minded donors on the theme of women’s and girls’ empowerment and deliver remarks at a Bill & Melinda Gates Foundation event on nutrition with Mr. Gates. Minister Bibeau’s trip to Washington D.C. Parliamentary Secretary Gould discusses the changing development landscape at the RESULTS Canada 2016 Conference. "Here are the participants from the Indonesian Ministry of Religious Affairs and UIN Makassar at the Ottawa Conference on Intelligent Global Development. Cowater’s delegates to the conference are staff from our project 'Local Leadership for Development', in Indonesia, the project is funded by Canada’s International Development – Global Affairs Canada"
Canada announces over $75 million in support of women's education, health, nutrition and for countries hosting Syrian refugees The Honourable Marie-Claude Bibeau, Minister of International Development and La Francophonie, today announced $75.4 million in support of projects in health, education and nutrition, as well to a financing mechanism that can assist countries hosting large numbers of Syrian refugees. This aims at increasing women’s social and economic participation; improving access to health, education and nutritious food in developing countries; and promoting the empowerment of women and girls around the world. Minister Bibeau also announced support for the Middle East and North Africa Concessional Financing Facility that will help Jordan and Lebanon respond to the refugee crisis and assure the well-being of vulnerable populations within their borders. Today’s announcement was made during Minister Bibeau’s visit to Washington, D.C., for meetings of the World Bank and International Monetary Fund.